Home » RV Lifestyle » Got issues: How can I fix my Norcold RV fridge? 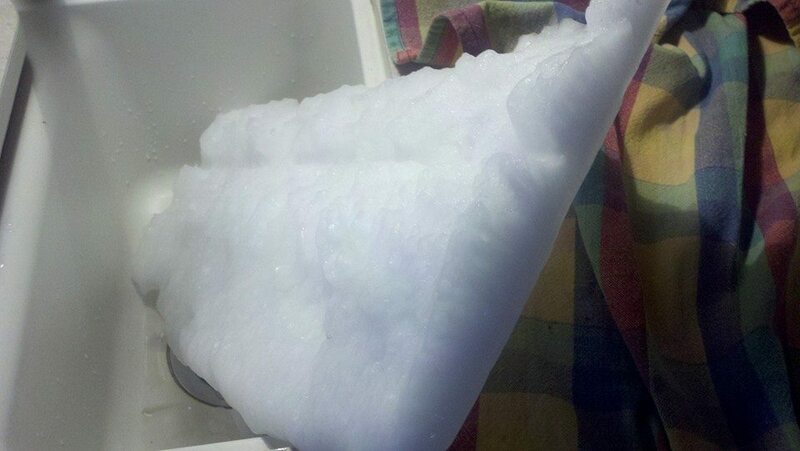 A portion of the glacier of ice that once occupied my freezer. It’s about two inches thick here, but started as three inches in the center. Yeah, yeah, so I let it go for a while – what of it? My Norcold fridge doesn’t do well in high heat, the current temperature in south central Texas. I’m hoping you have better solutions than what I’ve tried. Besides, I’m losing interest in the Online Dating Chronicles. Not even the “30 Boyfriend Rules” profile written by two little girls got a response. Perhaps potential candidates suspected my snarkiness in posting it in place of my original profile. Issue #1: The back of the freezer has accumulated a glacier’s worth of ice. I suspect the extra weight negatively effects my gas mileage. Global warming is not effecting my RV fridge. If there is such a thing as Global Warming, the world is welcome to use my fridge to help combat it. I tried to thaw it, only to have my hairdryer die after about two minutes. WTF??? The hairdryer still works, but seems to over heat and shut down when trying to thaw the fridge. It wasn’t making a dent in the glacier anyway. Next, I chipped at the wall of ice with a knife for another thirty minutes, switching arms, back and forth, as each arm tired out. Thirty minutes and two aching arms later, I had made such little progress it was depressing. 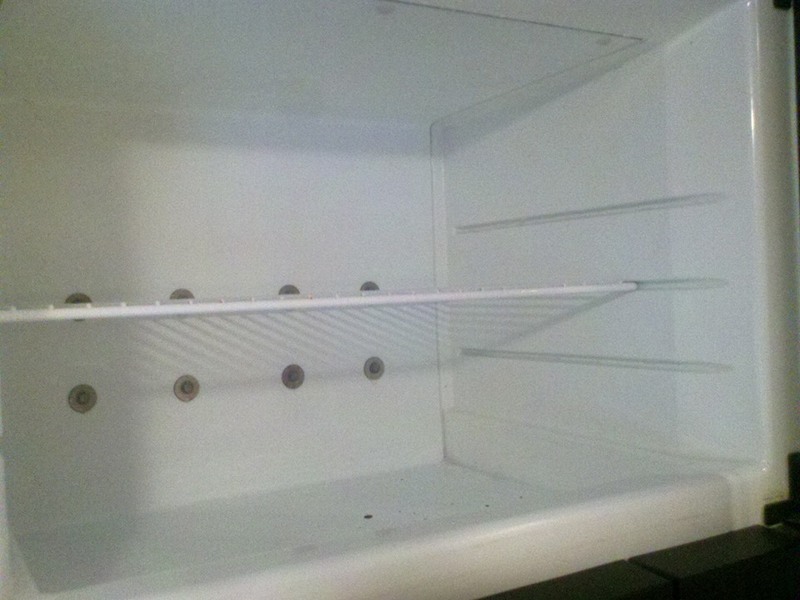 Issue #2: The small drip tray in the top, back of the regular cold area of the fridge freezes over and won’t drain. The only (temporary) solution I can engineer is to open the access panel on the outside of my RV, and hang the small drip hose outside. I clear the small weep valve at the end of the hose by sticking a thin piece of wire through it. Leaving the hose outside the vent seems to help the flow of water – once it manages to melt. You might think from all this accumulation of ice that I keep my fridge on #5 (the coldest setting). I never turn it higher than #3. If I turn it higher, the cold stuff freezes, too, so at most I leave it on #3. On those frozen cold days, I turn it to #1. It seems to do a bit better in the cold weather. Got any solutions for thawing the massive glacier? Preferably one(s) that don’t require turning off the freezer for a few days and getting water all over the floor. Got any solutions for the water at the top of the cold section that freezes rather than drains? If I turn the fridge lower, the ice melts, but the food warms. Not good. What, if any, maintenance do you do on your Norcold fridge? I used the “pan of hot water and beach towels” idea mentioned below in comments. I also, due to a life-long lack of patience, chipped at the glacier with a butter knife and put hot water on the glacier with a sponge. The critical moment – where the largest chunk of the glacier came out all at once – was a complete surprise: I decided to try getting hot water behind the block by slopping the hot water at the top edge, and then try working at the glacier as a whole with the butter knife (rather than chipping off edges as I could). I worked the butter knife at the edge of the glacier to get leverage on the whole this – and BAMM! it popped off! I was surprised. The whole process took about and hour (boiled the pan of water only twice). I believe the slopping of hot water behind the glacier, and working at the edge with the butter knife really helped shorten the process. Turn it off, unplug the 12 volt fuse (so the door light doesn’t come on), leave the doors open, throw some beach towels in there, and go walkabout for a 2 hours, come back and remove some ice that is now melted enough to just toss out. Then go walk about for 2 more hours, come back and shop-vac or wipe up all the water. I know no fun. They just have to be defrosted from time to time to work right. All that ice is bad for your fridge. and your auto defrost modes will work better once you defrost. You can toss your food in a little portable cooler with some ice. Sorry not the solution ya wanted. travelfables’s last post ..Board, Floored, and Cabled. Thanks, TravelFables! I appreciate the help. Yes, I had hoped to avoid that messy process. Unfortunately, it may be my only option. You may also try lowering your setting a notch for 24hrs. Check if the fridge drip pan stops freezing. Also, try taking care of the ice in the freezer before it becomes a literal ice box. Good luck! hot/extra warm water in a tray of some sort and put in the freezer (change out as the water cools) might take a while but it will melt your iceberg. A large towel (beach towel maybe) placed in the bottom of the fridge will help to catch the drainage, you might want to have two or three on hand. Clean out your drain tube..lol. Happy defrosting. Thank you, Carmen! In the end, that’s the solution I used. I boiled a pan of water and placed it in the fridge. I added chipping away with a butter knife, and hot water sponge on ice. It didn’t take nearly as long as I suspected. In the future, be careful about using the butter knife trick as you could accidentally poke a hole in the freezer, if you’re like me, the cost of replacing it would be a serious hit to the bank account, once a month or so, do the water thing and it will help to keep your freezer glacier free. I will have to admit to having done the butter knife trick myself as i got tired of heating and reheating the water..lol, of course this was in a up right full sized freezer. Yeah, I was a bit worried about using the butter knife, but for two things: I have a vague memory of seeing my mom use one to defrost our fridge when I was little. And, because I have no patience for such loooong things as watching a freezer defrost. I tried reading a book, but kept putting it down to chip away. Unless it’s a much newer model than mine (1999), it will not have an auto defrost cycle. You will need to keep up with the manual defrost cycle. Also, some have been able to boost the overall efficiency by mounting a fan or two behind the fridge. And yes, keep the drain tube clear. Thanks, Andy! It’s a 2004/5 (RV is 2005, chassis and some parts are 2004), so I’d have assumed it had some sort of self-defrost cycle. Of course, I could’ve pulled out the manual (which I may or may not have). That drain tube in the bane of my existence. I wish I could get the weep-valve off to clean it. Also put a fan inside the fridge. First get two thermometers. The freezer should be 32 degrees or less. Ideally around 28. The food section should be below 40 degrees. Ideally around 36. If you have your temp setting lower than needed it will cause your fins to build up with ice. Next, make sure your door(s) or sealed by passing a dollar bill between the seal and the fridge. Air entering creates moisture that will collect and freeze. Next, make sure you have not over stuffed your fridge. Air need to circulate in the unit. Also, remember that your fridge is a heat absorption unit that works entirely different than a home fridge. On really hot days the heat that collects at the rear of the fridge must be vented to the outside. A fan that helps cool down those coils can be affixed to help that process out. Finally, the fridge has a circuit board that tells it when the fridge should shut off to keep it from over cooling. This could be failing. Plus, these are not frost free fridges. Some ice build up should be expected. Hope this helps. If you are not already aware of it, check out IRV2.COM. You can spend more time there learning about your EV then I spent reading ALL your blog entries. Maybe not quite as much fun, but it can save you a lot of time, money, and aggrevation. Thanks, I need to check it out to find a solution to the drip system/weep valve issue.